At the first sight of enemy aircraft, the watchman hammered out a rhythm on the hunk of bomb casing. The clanking of the homemade gong warned the villagers of the impending attack and they ran for the nearest trench. Hidden beneath the undergrowth, the trenches led to the tunnels where families could safely wait out the air strike. 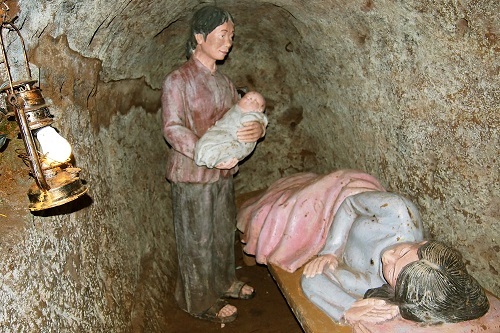 The Vinh Moc tunnels served as a bomb shelter and underground village for the people living through some of the heaviest bombardment of the Vietnam War. As we entered the tunnels, we stooped low, trying not to crack our heads on the ceiling. “These tunnels were made for Vietnamese” our guide, Hai, explained cheerfully. She remained upright throughout, a luxury not afforded to us western giants. As we continued, shovel marks in the clay reminded us that this vast tunnel network had all been dug by hand. Descending further into the darkness, we were hit by a wall of heat. On a chilly grey day, the constant warm humidity of the tunnels was greatly appreciated. Reaching the second level, around 15 metres down, we found the residential area. Here small alcoves had been cut into the walls, one for each family. Barely able to fit all three of us into an alcove, we concluded the families must have been crammed in like sardines. Not the most comfortable place to spend what could be days at a time underground. In the midst of this family area, we saw the maternity room. No bigger than the other alcoves, a total of 17 babies were born in this room during the Vietnam war. Our backs creaked with the strain of being bent double as we felt our way along the clammy walls. It was a relief to enter the relative brightness of the meeting room. This was the largest room and the only place we could stand up straight. This wider stretch of tunnel was also used as a classroom for children during longer stays underground. We then ventured even deeper, down a narrow, broken staircase. Thankfully the broken areas were slightly better lit and we made it safely to the third and final level. This was the best place for the well, which was on the verge of overflowing when we saw it. The shower room was conveniently located next to this water supply, with drainage channels flowing to the sea. 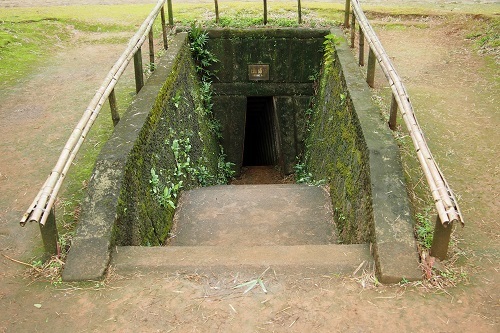 Although we found Vinh Moc tunnels very cramped, they had been designed for civilians and were considered spacious. 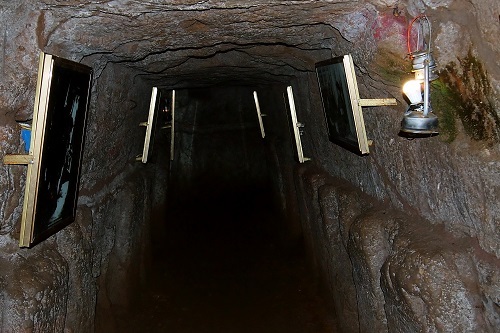 The tunnels used by the Viet Cong soldiers further south at Cu Chi were tiny in comparison. 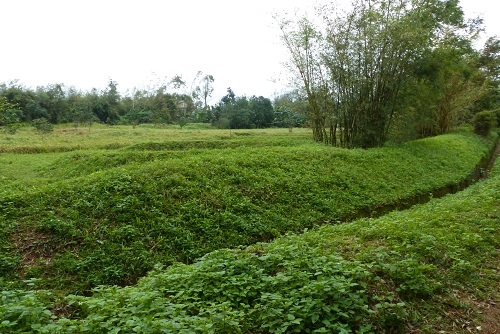 Why Dig The Vinh Moc Tunnels? During the Vietnam war, American forces turned the DMZ on the border between North and South Vietnam into a barren no man's land. Vinh Moc, just north of the border, was heavily bombed. Many people evacuated to safety, though a few remained to defend their homes and maintain vital supply lines. 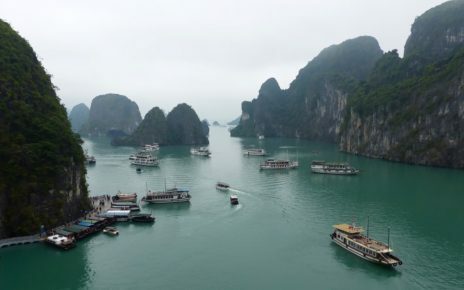 North Vietnam had an important military base on nearby Con Co Island. Brave volunteers from Vinh Moc would make the dangerous journey to the island. Disguised as fishermen, they rowed 28km off shore to deliver supplies to the soldiers stationed there. It's this supply line, part of the Ho Chi Minh Trail of the sea, that made this area a prime target for American bombardment. The people who remained at Vinh Moc dug the tunnels in order to survive this onslaught. Confounded by the Vietnamese tunnel networks, American forces developed ways to destroy them from the air. The villagers lived in fear of bombs that could burrow down into the tunnels before exploding. One of these drilling bombs did manage to pierce a tunnel at Vinh Moc while the residents were sheltering in their deepest bomb shelter. Luckily it failed to explode. Afterwards, the villagers appreciated the extra ventilation shaft created by the bomb. 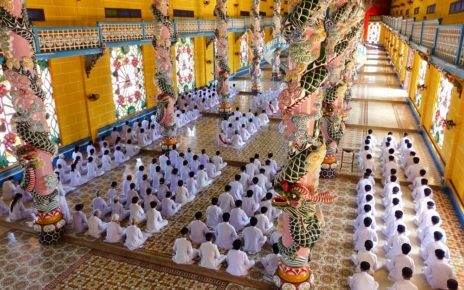 How To Get To Vinh Moc Tunnels? 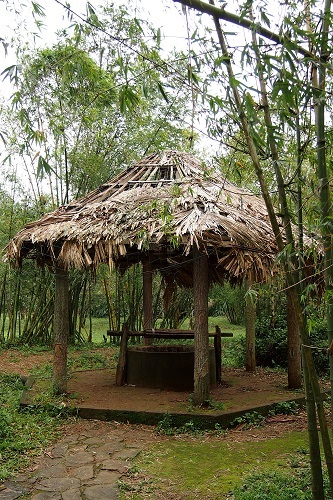 The nearest town to Vinh Moc is Dong Ha and many people use this as a base for exploring Vietnam's DMZ. We arranged a slightly longer day trip from Hue. A DMZ tour is a good way to see the numerous sites of interest in this area. 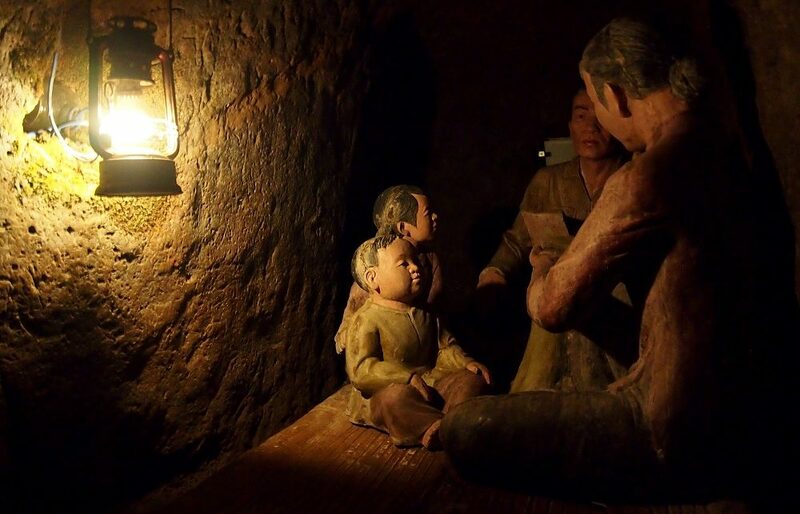 Vinh Moc tunnels are a definite highlight so make sure this is included in your tour itinerary. The cheapest tour option is a group bus tour. These operate on a very tight schedule. If you would rather see things in your own time, it is better to hire a car and driver. 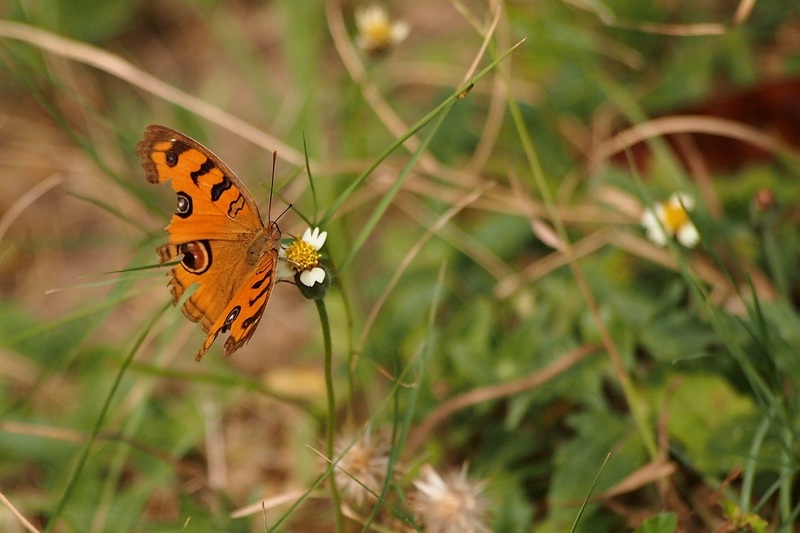 If you go for the car option, it is worth spending the extra to have a local guide accompany you.